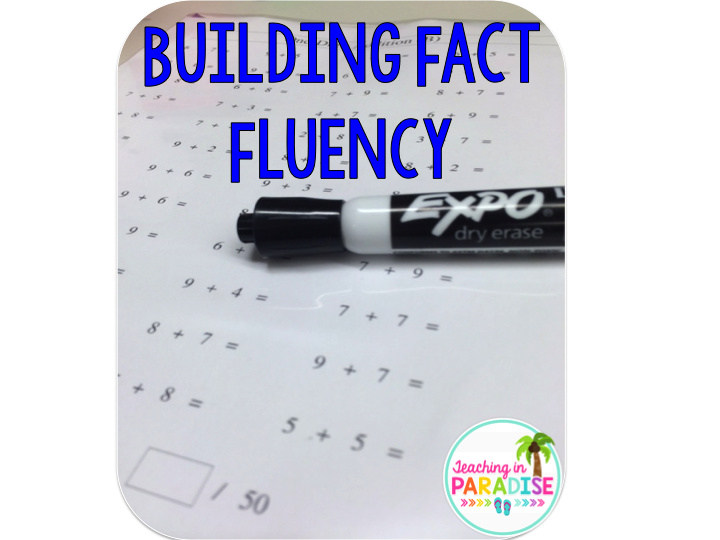 Today I'm here to share a tip with you on building fact fluency with your students. I'm not sure about you..but my students always seem to struggle with their addition facts when they enter third grade. Don't even get me started with the subtraction facts either! lol. I also hear from the 4th, 5th, and 6th grade teachers at my school that it is a never ending battle. Each year the kids just DO NOT know their facts. As teachers, if we expect our students to know their facts, we need to allow them the time to practice their facts! In an ideal world, they would actually be practicing at home, but we KNOW this doesn't happen at home for most! In my classroom, each day of our math block begins with Math Drills. This seriously only takes about 5 minutes of our block, and I see improvements daily. Rather than making copies and having them pile up on my desk wasting a ton of paper, I print one copy of each drill and insert them into clear sheet protectors. 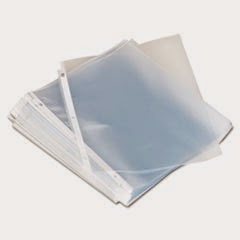 Then all of the sheet protectors go into their math drill folder. The students use their dry erase markers to do their drills. 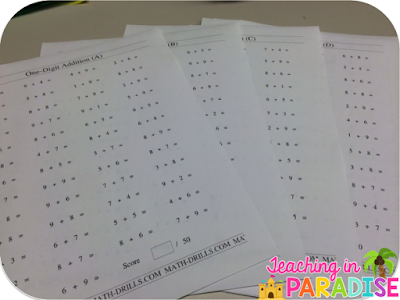 I quickly go over the answers and the students correct their own drills. We don't log our grades anywhere. The students take a mental note of how they did for the day, and they are challenged to beat their scores the next day. I get my drills from this awesome site: math-drills.comhttp://www.math-drills.com . You can print addition, subtraction, multiplication an division drills. I begin each year with addition. At the start of this school year, most of my kiddos couldn't even get through half of the page (50 problems on each page). After about a month or so..almost the entire class was whizzing through the entire page-with accuracy! Now, we are currently working on our subtraction facts. 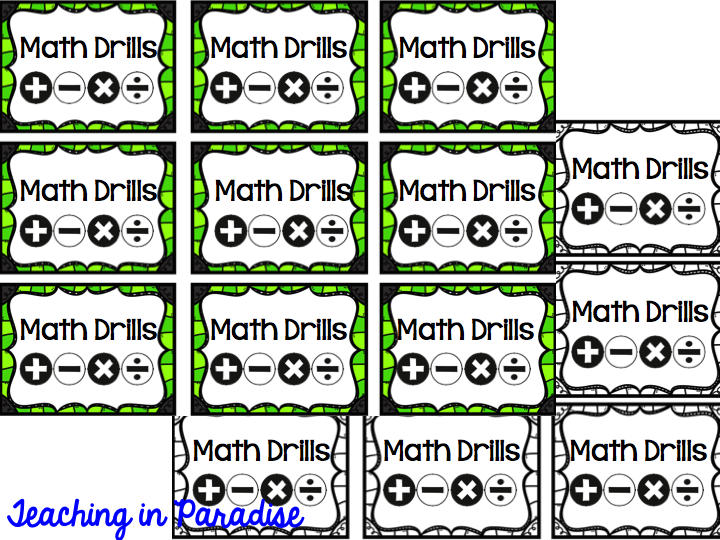 Eventually, we will add in multiplication drill pages as well. I usually add in 4 different sets of each operation. This way we can change it up each day. The drills from the website are already labeled 'drill a', 'drill b', and so on. This makes for easy reference to which drill set we will be working on. The best thing about is this is that it's easy and the kids WILL get their facts down! I recommend getting thicker sheet protectors, because they will last longer. I am still using the same drill folders from 2 years ago! I've created some labels for you to add to your math drill folders! All you need to do is print, laminate, and tape onto the front cover of the folders. I have included a black and white version to save on ink. You could easily print on colored paper for a pop of color. Also, there are red, orange, yellow, green, blue, and purple labels in this file. You can pick these labels up in my TpT Store for FREE! If you decide to use these drill in the classroom I would love to hear about it OR see it! Tag me in a photo (@teachinginparadise) on instagram so I can check out your math drill folders!! I like this post and thank you for this share. students always seem to struggle with their addition facts when they enter third grade. Don't even get me started with the subtraction facts either. If you want essay related topic you can go for custom essay writing service will get better result. Happy to read and understand a new method of teaching students maths. Thank you so much for providing useful information which will helps students to understand the basics of maths. These facts are interesting. Sometimes for kids, it is difficult to teach maths, they find difficulty in calculations. But If we use such kind of tricks then we can make them understand the things easily and they will enjoy studying maths. If they do practice then their concepts will be more clear. www.essaywritingexpert-usa.tumblr.com/ is also one educational resource which provides writing help to the students.